I took my son and a couple of his friends to the Kirkwood Ski Area for a day trip. They would spend the day snowboarding and skiiing while I went off snowshoeing. I had in mind a couple of minor unnamed summits around Lake Caples and thought it would make for a nice outing to circumnavigate the lake in the process. Little Round Top, a summit I had climbed previously, got in the mix a little by accident - I was having such a good time that I figured I would just continue along the ridge I was hiking. It wasn't until the next day that I realized I had been to Little Round Top for a second visit. Up at 4:30a, I had slept poorly for the last few hours as the poison oak I had brushed against a few days earlier was coming back to haunt me. I would get a temporary reprieve today as the rash tends to itch far less when I'm cold. And cold it would be - 34F in San Jose when we left and 24F when we reached Kirkwood around 8:30a. The saving grace would be very little wind, completely calm even for the first half of the day. This made conditions far more pleasant than they might otherwise have been and I enjoyed a very fun day of easy showshoeing. 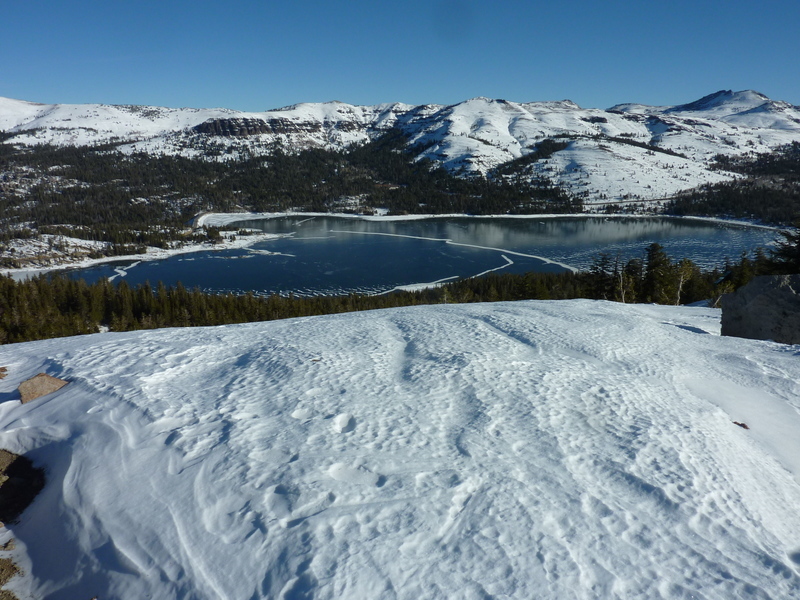 Peak 8,700ft lies on the ridgeline separating Caples Lake from Kirkwood Meadows and the resort. From the west end of Kirkwood Meadows, I went up the South Slopes, a 900-foot climb up smooth, open terrain, taking about 40min to reach the summit. Though not terribly high, it has a great view south to the resort and north to Caples Lake. Though I had started with more layers, by this time I was down to just a tshirt and it had the makings of a fine winter day. I dropped east off the summit, first through open slopes then into the forest. The snow in areas open to the sun were nicely frozen for easy walking, but in the forest the snow was deep and heavy, requiring much expenditure of effort. Emerging from the forest near the edge of the lake at its southern end, I had intended to walk around the lake's edge. But, finding the lake frozen (at least 3" of ice) I simply walked across it. It was mix of snow-drift cover with expanses of clear ice. The ice was permeated with air bubbles which helped me judge its minimum depth, and laced with cracks that told of various thaws and freezes that had taken place over the last month or so. I stopped often to examine the various features of the ice, marveling at little pockets of air trapped at various levels (from decaying organic matter, I presume). I noted some skate tracks as well, from a few souls who ventured almost a mile across the lake. Around 10:30a I left the lake and hiked north across SR88, climbing Peak 9,452ft from the south, a good 1,600-foot effort. I found a surprising number of snowshoe tracks once I reached the summit ridgeline. Ten years ago on such an outing it was rare to see other snowshoe tracks, but that seems to be changing. No longer do I find mostly cross-country ski tracks as I have in the past. It was almost 11:30a by the time I topped out on this second peak. I had planned to start back after reaching this point but I was enjoying the day so much and finding the effort much easier than I expected thanks to snow conditions most favorable to snowshoeing, that I decided to continue along the ridgeline to the northwest. I could see a higher summit in the distance at the end of the high ridge, not realizing it was a summit I had climbed five years earlier, Little Round Top. This very pleasant hike goes over two intermediate summits without any technical issues along the way. The views north are open to the Lake Tahoe region, taking in much of the lake, as far as Mt. Rose on the opposite end. To the northwest is the very snowy Desolation Wilderness with Pyramid, Jacks, Dicks and Tallac all prominent. After an hour's effort along the ridge, I took a long break at the summit of Little Round Top to eat a nice lunch my wife had prepared for me the night before (pretty cool, huh?). When I was done I texted her a message thanking her for it along with a view of Kirkwood I had from my lunch spot. Nice to see you back in 'God's Country' ! No more nasty bushwhacks, irate property owners or border agents . . . HAPPY NEW YEAR from Northern Nevada !!! Bob, with all the times you bushwhack, how do you keep from getting poison oak rash more often? You said that the leaves were off, you can still get it then? I've gotten good at IDing the stuff in most seasons. In winter it's tricky. The branches tend to be light brown and not dry/brittle/dead as other stuff at that time. I suspected it on this one, but was in denial. I'm still paying for that mistake. And yes, you can get it from the branches just as easily. I may soon be driving a LEAF, depending on how it goes. I'm waiting on installing solar panels, and then getting the financing. Now that Chevy is coming out with a 35k 200 mile range, I may be up for that instead. I thought that say an electric Camaro might do pretty good, but then there's the fickle public. With gas now at 2.259, most people won't be thinking how was and how it inevitably will be again. I logged some 3,000 miles over the last month or so in support of my move, great that it's not $5/gal., but about 3,000/40 mpg so say 75 gallons so maybe $200. I've mostly enjoyed commuting over the summit, with my speeded-up videos by my dash cam on Facebook and at my website, saving now the 1,500 for movers quote, after the expected $300+ to get everything remaining. So, a thou saved, seeing near daily sights of the snow, fun video making, some snow hiking at the rest area now, and I'm done moving!